I believe that the writers are skewed by todays stats. cases in point dale murphy pre steroid era ,you pre steroid era and crime dog, fred McGriff,,. I saw you all play and I know a HOFer from a game defamer. Jim Kaat belongs in the HOF. Period. Dear Kitty,great article,I must admit I was stunned when none of the golden era made it in.Tony Os fragile knees could have been his HOF downfall.Excellent point on Hispanic Heritage. A must-read post from MLB Network’s Jim Kaat on the recent balloting by the Baseball Hall of Fame’s Golden Era Committee. For a ling time now, I have thought that the HOF balloting needed change. I always remember this comment made by BBWAA, who admitted he failed to vote for Mickey Mantle because he didn’t realize he had become eligible. Also, I think about why, Willie Mays or Hank Aaron did not garner by 100% of the votes. I do not agree with the veterans selections some years, but Jim Kaat, Tommy John, Marvin Miller, not members I do not understand. Another missing name is Dr. Frank Jobe the Dodgers team physician who performed the surgery that has save the careers of so many players. 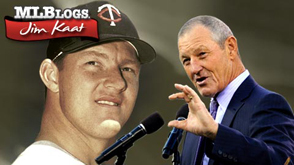 Jim Kaat is a class act something the Baseball Hall of Fame could use. Why isn’t Jim Kaat in the Baseball Hall of Fame? I am currently reading your book Still Pitching and believe that as time goes on pitchers like JIm Kaat and Tommy John are going to be recognized as HOF caliber because none of the current crop are measuring up. No one will win 300 games again! As a Tiger fan I remember every time the Twins were going to play them I would look to see if you were pitching for the Twins; because I knew it would be a long day for the Tigers if you did. A classy pitcher in the day and a man with great class today. I pray you continue to enjoy your life with health and happiness and peace and if the HOF comes your way so be it; but enjoy the day today. The committee didn’t distinguish itself during the vote last month. Unfortunately if some of those narrow losses or no decisions went your way you’d be in. Obviously from your description the process needs to reformed again. Reblogged this on fourzip's rumblings. Jim, I am a lifelong Phillies fan, and I enjoyed the seasons you were in Philly. Some darn good squads,heh? Allen was a great player here for many seasons. Thanks for the insight.